Cadbury Dairy Milk Chocolate with marshmallows, cherry flavoured jellies, peanuts and coconut. Milk, SUGAR, COCOA BUTTER, COCOA MASS, Milk SOLIDS, PeanutS, COCONUT (CONTAINS PRESERVATIVE E223 (Sulphites)), MARSHMALLOWS (GLUCOSE SYRUP (Wheat AND CORN), GELATINE, THICKENER (E1401 FROM Wheat), GLAZING AGENT (PALM OIL, E903), FLAVOURS, COLOUR (E120)), CHERRY FLAVOURED JELLIES (GLUCOSE SYRUP (Wheat AND CORN), THICKENER (E1401 FROM Wheat), GLAZING AGENT (PALM OIL, E903), FLAVOUR, COLOUR (E163), FOOD ACID (E330)), EMULSIFIERS (Soy LECITIN, E476, FLAVOURS. Contains Milk Chocolate 80%, Peanuts 7%, Coconut 5%, Marshmallows 4%, Cherry Flavoured Jellies 4%. This is absolute favourite choc. I work in a Dental Practice and whenever any of the patients are going to NZ or OZ I Always ask them to bring me some back, even if I don't really know them. I brought 50 bars back from NZ and had intended to give a few of them as gifts but I just couldn't part with any of them! 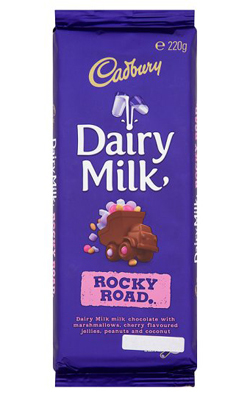 I wish Cadbury's would produce Rocky Road in the UK. Sexiest Chocolate In The World! Mmmmmm..... This bar should contain a warning because it leaves you craving for more! It is the sexiest bar of choccy in the world and brings back fond memories of OZ. I would really recommend this chocoate to anyone who like a chocolate with lots of fillings..YUMMY! Best chocolate I've ever had!